They’re all-in on the modern day and First Civilisation stuff this time. At events like these, Assassin’s Creed developers seldom say a word about the modern day aspect of upcoming games in the series. That’s to the relief of the large part of the fanbase that isn’t into that stuff, and to the frustration of those of us who love it and have lately been disappointed by how slender recent offerings have been. To my delight, Dumont happily explained the set-up for the modern part of the game. 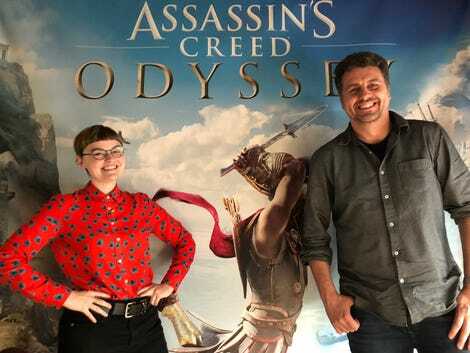 Even more exciting for us weirdos who like the deep lore might be the extent to which the Odyssey developers are promising connections to the mysterious First Civilization, the barely-seen progenitors to the series’ Assassin-Templar conflict. Your main weapon is a spear, not a hidden blade. 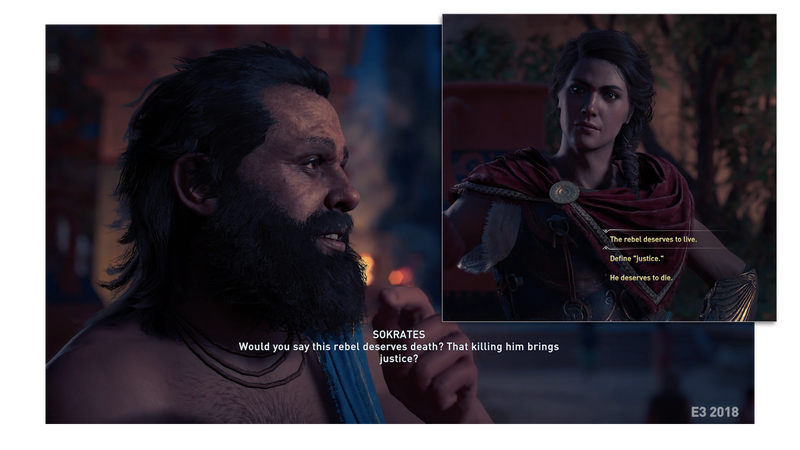 Whether the player decides to be Alexios or Kassandra, they’re playing as the child of Leonidas and wielding his spear. In the lore of the series, Leonidas is said to have First Civilisation DNA. His spear, rather than a hidden blade, is the game’s signature weapon. It is a First Civ artefact and possesses a seemingly otherworldly power. The gist of the ancient Greek storyline is that your family line is prophesied to bring doom to Sparta, which somehow leads to you getting thrown off a mountain, then surviving and resurfacing 17 years later as a mercenary who gets the chance to discover a conspiracy against your family. Revenge for attacks on one’s family is an AC tradition. Just ask Ezio and Bayek. You have a bird again. 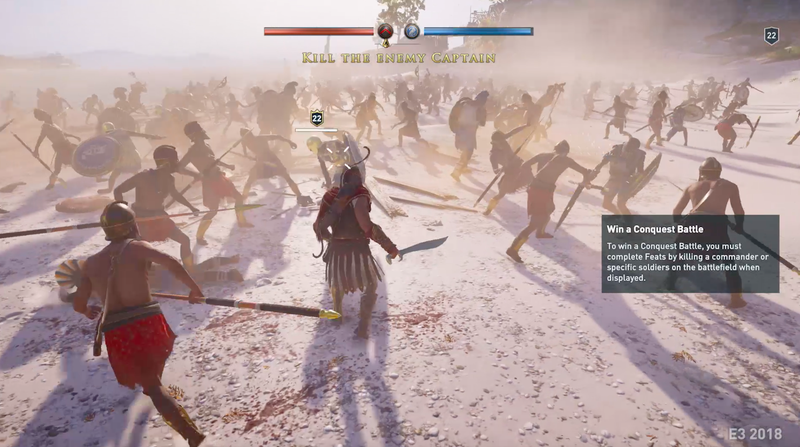 Odyssey uses enough of Origins’ graphical tech and iconography that it might be seen as a re-skin of last year’s ancient Egypt epic. 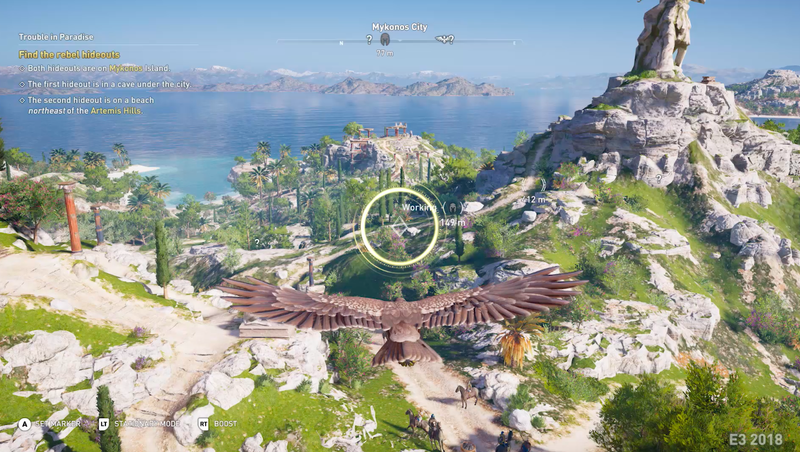 Origins players will recognise a lot of the same interface and gameplay options including the returning radial compass that replaced the franchise’s old mini-map and even the return of a drone-like bird who can survey the landscape, spot treasure, and highlight and harass enemies. The bird is called Ikaros in this one. Building on a recent game is not necessarily a bad thing. Some of the best-regarded AC games, including II, Rogue, and Syndicate all were relatively light on technological innovation and were instead strong on gameplay improvement and creative world-building. Character outfits will be far more customisable. 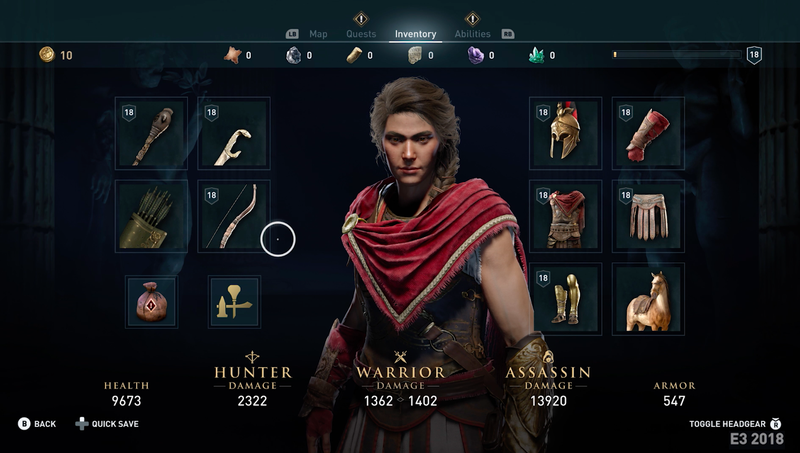 Despite surface similarities, there are heaps of tweaks to the Origins formula evident even in Odyssey’s E3 demo. The loot system returns, for example, but instead of one category for wearable gear there are five. Gear is classified by rarity. Each piece of gear can be enhanced with engravings that might increase critical hit damage or fire damage, for example. They’re improving stealth. 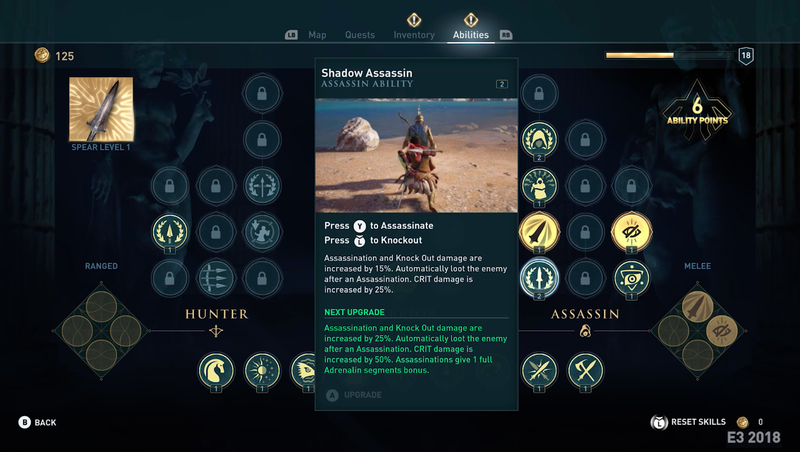 Stealth was an option in AC Origins, but not a great one. 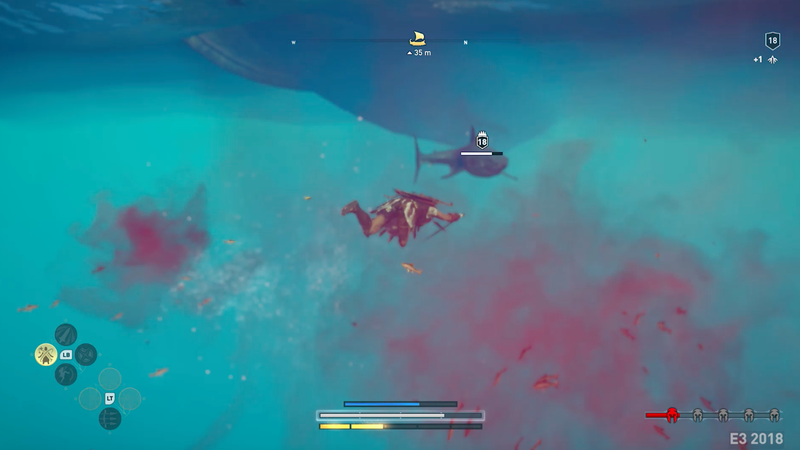 That game’s lead protagonist, Bayek, couldn’t reliably assassinate high-level enemies with his hidden blade, and players were generally not incentivised to clear enemy bases without raising alarms. 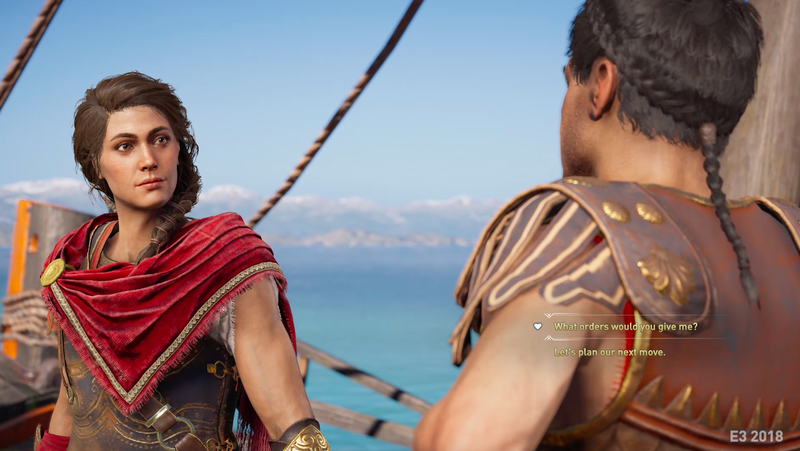 Dumont said they’ve tweaked the experience points payout for stealthy play in Odyssey, giving players more for stealth kills, on the assumption that the time spent to get one stealth kill might be the same as running in and loudly chopping through a few enemies. 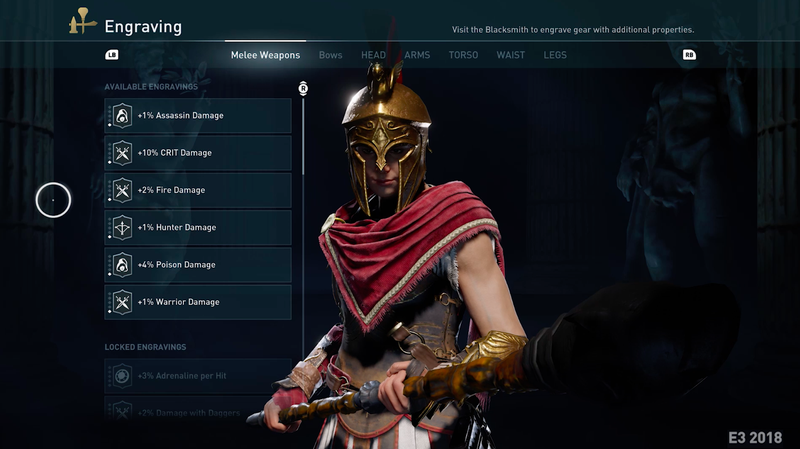 Leonidas’ spear, taking the place of the hidden blade, will be good for a one-hit stealth assassination of enemies the same level as the player or one level above, according to Dumont. Most characters in the game can join your ship’s crew. The player’s ship is called the Adrestia, it sounds like it might double as their de facto HQ. Most of the game’s enemy combatants and even many of its civilians can be recruited to become part of the ship’s crew (or to serve as distractions on land for stealth-oriented players). 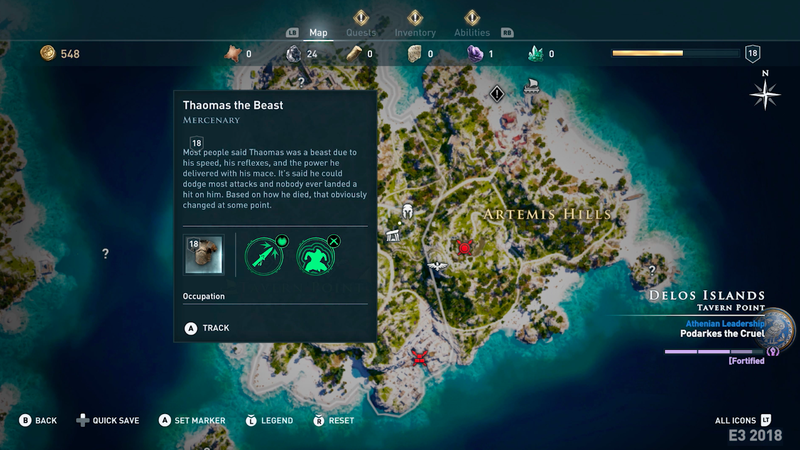 Those recruitable followers will offer stat bonuses and perks, some of which will be visible by your bird as it scouts the areas of the game’s landmasses that you explore. 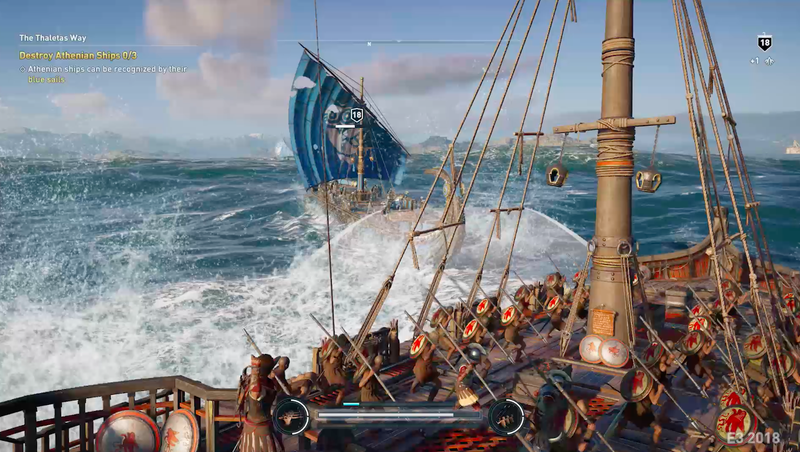 According to the Odyssey developer who watched us play the game’s E3 demo, players will be able to customise the ship’s look, down to the gear the crew wears.